IMS takes no position regarding the validity or scope of any intellectual property or other rights that might be claimed to pertain to the implementation or use of the technology described in this document or the extent to which any license under such rights might or might not be available; neither does it represent that it has made any effort to identify any such rights. Information on IMS’s procedures with respect to rights in IMS specifications can be found at the IMS Intellectual Property Rights web page: /sites/default/files/imsipr_policyFinal.pdf. · The Binding Files – one of the outputs of the LIS specification is the set of WSDL/XML Schema Definition (WSDL/XSD) binding files. Each service has its own set of WSDL/XSD files. It is these files that are used by code-generation tools to create the source code that handles the SOAP messages and XML data structures. Some small changes are required to the WSDL files to map the SOAP messages to the actual server-based implementation of the Web Service. Each of the services has a set of vocabulary files that contain the set of default vocabularies defined in the Information Model. The vocabulary files are instances of the IMS GLC Vocabulary Data Exchange (VDEX) specification. The Learning Information Services (LIS) specification is the definition of how systems manage the exchange of information that describes people, groups, memberships, courses and outcomes within the context of learning. This document is the IMS GLC Learning Information Services v2.0 Specification Primer; the specification is available in [LIS, 11a]. The LIS specification supersedes the IMS GLC Enterprise Services v1.0 specification [ES, 04]. This specification is based upon the aggregation of the Person Management, Group Management, Membership Management, Course Management, Outcomes Management and the Bulk Data Exchange Management Services specifications. The Learning Information Services Specification v2.0 can be implemented using both a Web Services infrastructure (based upon a SOAP/http transport mechanism) and the Lightweight Directory Access Protocol (LDAP). 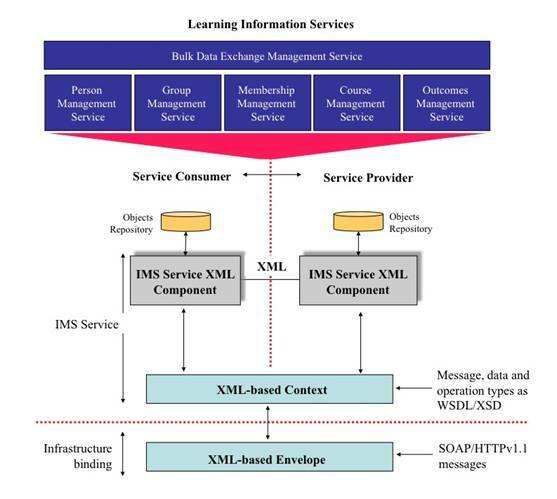 [BDEMS, 11a] IMS GLC Bulk Data Exchange Management Service v1.0 Information Model v1.0 Final Release, L.Feng, W.Lee and C.Smythe, IMS Global Learning Consortium, June 2011. [ES, 04] IMS GLC Enterprise Services Specification Final Release v1.0, C.Smythe and C.Vento, IMS Global Learning Consortium, June 2004. [LIS, 11a] IMS GLC Learning Information Services v2.0 Specification v1.0 Final Release, L.Feng, W.Lee and C.Smythe, IMS Global Learning Consortium, June 2011. [LIS, 11c] IMS GLC Learning Information Services v2.0: Core Profiles v1.0 Final Release L.Feng, W.Lee and C.Smythe, IMS Global Learning Consortium, June 2011. [PMS, 11a] IMS GLC Person Management Service Information Model v2.0 Final Release, L.Feng, W.Lee and C.Smythe, IMS Global Learning Consortium, June 2011. · Outcomes Management Service (OMS) – in Enterprise Services v1.0 a simplified form of functionality was supported using the IMS GLC Membership Management Services v1.0 [MMS, 04]. In general, there is NO backwards compatibility between the usage of the OMSv1.0 and the ways in which MMSv1.0 has been implemented to support outcomes management. Vendors may define compatibility bridges for their own implementations but these are outside the scope of this specification. If the Core Profile, either alone or in combination with one or more of the Addition Profiles, is inadequate then a new profile can be created and registered with IMS GLC. · The LIS Specification – describes how the LIS is composed using its six component services [LIS, 11a]. · Information Models – these documents contain the normative description of the various service definitions, data structures and their relationships. Each of the six services has its own Information Model [PMS, 11a], [GMS, 11a], [MMS, 11a], [CMS, 11a], [OMS, 11a] and [BDEMS, 11a]. · The Binding Files – this is the set of WSDL and XSD files that realize the binding. Each of the services has a set of vocabulary files that contain the set of default vocabularies defined in the Information Model. The vocabulary files conform to the IMS GLC Vocabulary Definition Exchange (VDEX) specification [VDEX, 04]. e) The LIS Core Profiles [LIS, 11c] should be used as the basis for providing the core service capability for SIS/LMS exchanges. This profile identifies the minimal set of service operations that are required to create a ‘useful’ learning information service (the profile identified less than 5% of the full set of service operations as necessary). Summary: This document is a primer for the IMS GLC Learning Information Services (LIS) specification. LIS is a collection of six component services that are combined to provide the required functionality. These component services are: Person Management Service; Group Management Service; Membership Management Service; Course Management Service; Outcomes Management Service; and Bulk Data Exchange Management Service. As part of the specification a profile for Higher Education has been created. IMS GLC has created one such profile for Student Information System/Learning Management System exchanges [LIS, 11c].